The full text: Egocentrism Over E-Mail: Can We Communicate as Well as We Think? Kruger, Justin; Epley, Nicholas; Parker, Jason; Ng, Zhi-Wen,** “Egocentrism Over E-Mail: Can We Communicate as Well as We Think?” Journal of Personality and Social Psychology, Volume 89(6), December 2005, pp. 925-936. Full text available for download or email through the PsycARTICLES/Ovid database. Without the benefit of paralinguistic cues such as gesture, emphasis, and intonation, it can be difficult to convey emotion and tone over electronic mail (e-mail). Five experiments suggest that this limitation is often underappreciated, such that people tend to believe that they can communicate over e-mail more effectively than they actually can. Studies 4 and 5 further suggest that this overconfidence is born of egocentrism, the inherent difficulty of detaching oneself from one's own perspective when evaluating the perspective of someone else. Because e-mail communicators “hear” a statement differently depending on whether they intend to be, say, sarcastic or funny, it can be difficult to appreciate that their electronic audience may not. Social judgment is inherently egocentric. When people try to imagine the perspective, thoughts, or feelings of someone else, a growing body of evidence suggests that they use themselves as an anchor or reference point. Although precisely why this occurs - whether the result of an overlearned and generally valid heuristic, the residual byproduct of an earlier stage of childhood egocentrism, or the inevitable consequence of an effortful cognitive process such as anchoring and adjustment - is a matter of some debate, the fact remains that the assessment of another's perspectives is influenced, at least in part, by one's own (Camerer, Loewenstein, & Weber, 1989; Epley, Keysar, Van Boven, & Gilovich, 2004; Fischhoff, 1975; Flavell, 1977; Fussell & Krauss, 1991; Gilovich, Medvec, & Savitsky, 2000; Gilovich, Savitsky, & Medvec, 1998; Hoch, 1987; Inhelder & Piaget, 1958; Kelley & Jacoby, 1996; Keysar, Barr, & Horton, 1998; Keysar & Bly, 1995; Nickerson, 1999, 2001; Ross & Ward, 1996). Nowhere is this tendency more apparent than in the music tapping study conducted by Elizabeth Newton (1990). Participants in her study were asked to tap the rhythm of a well-known song to a listener and then assess the likelihood that the listener would correctly identify the song. The results were striking: Tappers estimated that approximately 50% of listeners would correctly identify the song, compared with an actual accuracy rate of 3%. Of course, everyday communication is far less constrained than in the music tapping study. Seldom are we required to tap a course lecture or describe our research via Morse code (although it can occasionally seem that way). However, we believe that the lessons learned from Newton's research are nevertheless applicable to everyday communication and one facet of everyday communication in particular: electronic mail (e-mail). E-mail is one of the most successful computer applications yet devised (Dimmick, Kline, & Stafford, 2000; Marold & Larson, 1999; Wittaker & Sidner, 1997). According to the U.S. Department of Commerce, nearly half of the U.S. population currently uses e-mail, and the number of e-mail messages currently outnumber letters sent by the U.S. postal service (Thompson, 2001). Some have even claimed that e-mail, along with the invention of writing, printing, and telegraphy, represents the only truly revolutionary change in communication technology (de la Sola Pool, 1984). Although text-based communication is nothing new (people have been writing letters to each other for centuries), its ubiquity is: Whereas letters were at best a monthly or weekly affair, people use e-mail on a daily - even hourly - basis (Gatz & Hirt, 2000). And for good reason: E-mail is a quick and convenient method for people to conduct business, stay in touch with friends and family, and even collect data. But there is something missing from e-mail as well. As psychologists and laypeople know, much of communication is nonverbal (Archer & Akert, 1977; Argyle, 1970; DePaulo & Friedman, 1998). Although the value of nonverbal communication is sometimes overstated (DePaulo, 1992; Krauss et al., 1981; Rime, 1982), the fact remains that nonverbal information is an important cue to the speaker's meaning, particularly when the literal content of the message is ambiguous (Allbritton, McKoon, & Ratcliff, 1996; Price, Ostendorf, Shattuck-Hufnagel, & Fong, 1991). After all, the same statement can, depending on tone, emphasis, and expression, be either sarcastic or serious, disrespectful or deferential, sanguine or somber (Abrahams, 1962; Clark, 1996; Drew, 1987; Goffman, 1959). Similarly, people use inflection and gesture to soften the blow of negative communication, to literally tone down bad news or mute unfavorable feedback. Whereas speech conveys not only what is said but also how it is said, e-mail is limited to the former. As such, e-mail is an inherently more impoverished communication medium than voice or face-to-face communication (Kiesler, Siegel, & McGuire, 1984; Sproull & Kiesler, 1986; Thompson & Nadler, 2002). This limitation is likely to be fertile ground for miscommunication and, in particular, a lack of awareness of that miscommunication. E-mail communicators, after all, are well aware of the precise message that they intend to convey. Over e-mail, we know that we are being sarcastic when referring to the comic brilliance of, say, Adam Sandler, just as we know that we are not when making the same statement of John Cleese. Note, however, that what is obvious to us may be considerably less so to the person on the other end of the computer. Whereas we “hear” a statement differently depending on whether we are speaking sarcastically or seriously, our e-mail audience, without the paralinguistic cues that in voice communication flag sarcasm, may not. And because it can be difficult to separate one's own experience of a stimulus from the stimulus available to one's audience, one's e-mail message may be more ambiguous than one realizes. We suspect such misunderstandings are common. People routinely overestimate how well they can communicate over e-mail, we offer, particularly when the meaning of the message is ambiguous. We further argue that this overestimation is caused, at least in part, by egocentrism, the inherent difficulty of moving beyond one's subjective experience of a stimulus and imagining how the stimulus might be evaluated by someone who does not share one's privileged perspective. Given the growing popularity of e-mail and the fact that successful communication depends partly on the ability to anticipate miscommunication (Keysar & Henly, 2002), these predictions are of both practical and theoretical importance. Despite this, our hypothesis has yet to be investigated in either the social judgment literature or in the rapidly emerging literature on computer-mediated communication. Several researchers have investigated the ability of individuals to communicate over e-mail (e.g., Dennis &amp;amp;amp;amp;amp;amp;amp; Kinney, 1998; Hebert & Vorauer, 2003; Thompson & Nadler, 2002; Walther, 1993, 1995; Walther, Loh, & Granka, 2005), but no researchers have investigated the perceived ability of individuals to do so, nor have they contrasted the two. The one published exception of which we are aware is a study by Sherman et al. (2001). These researchers found that home page creators predicted that others would form a more positive impression of them than was actually the case, and that this was less true when participants communicated face to face. If one assumes that the home page creators intended to portray a positive impression of themselves, then these data could be interpreted as evidence of overestimation of communication effectiveness. However, note that these researchers did not investigate e-mail, nor did they investigate the cause of this overestimation. The present research was designed to more directly examine overconfidence over e-mail as well as the mechanism thought to underlie it. In five studies, we compared the perceived and actual ability of participants to communicate over e-mail. In each study, we hypothesized that participants' predicted ability would exceed their actual ability. Our last two studies tested the egocentrism account of this overconfidence by experimentally manipulating the phenomenological experience of e-mailers. We also compared overconfidence over e-mail with more traditional modes of communication. Whereas our egocentrism analysis suggests that e-mail should be associated with greater overconfidence than, say, voice communication, this is by no means a forgone conclusion. Prior work has found that for all the value of nonverbal information, people have occasional difficulty interpreting nonverbal information (DePaulo, 1992; Keysar & Henly, 2002; Lanzetta & Kleck, 1970). What is more, communicators are often insensitive to these difficulties, believing their nonverbal cues are clearer to others than they really are (Keysar & Henly, 2002) - even when they do not wish them to be (Gilovich et al., 1998; Vorauer & Claude, 1998). All of this suggests that voice communication might be associated with more, rather than less, overconfidence - the opposite of what we predict. To help shed light on this issue, Studies 2 and 3 compared overconfidence in e-mail communication with that of voice communication. Participants in Study 1 were given a list of 10 topics and asked to write two statements about each one. Half of the statements were to be serious and the other half sarcastic. Senders e-mailed the statements to another participant, who attempted to identify which sentences were intended to be sarcastic and which were not. The senders then predicted the receivers' accuracy. We predicted that senders would overestimate their ability to communicate sarcasm to the receiver. Twelve Cornell University students participated in exchange for extra credit in an introductory psychology or human development course. All participants had their own personal e-mail account and at least some experience using e-mail, a characteristic of all participants in this research. Participants then anticipated how the receiver would interpret their statements. Specifically, participants were told (correctly) that the receiver would attempt to identify which statements were intended to be sarcastic and which were not. Participants then indicated, for each topic, whether they thought the receiver would be able to correctly identify the nature (sarcastic or nonsarcastic) of the two statements by checking a box marked “yes” or “no.” Each participant then read the 20 statements that had been e-mailed by the other participant and indicated on a questionnaire which statements they believed were sarcastic. The design was thus fully within-participants, with each participant serving as both a sender and receiver. We expected participants to overestimate their ability to communicate sarcasm. To test this hypothesis, senders' predictions of the receivers' accuracy were compared with the receivers' actual accuracy. Because the data for each pair are interdependent, the data were analyzed at the level of the dyad. Specifically, we averaged each person's estimate of the number of topics (out of 10) that they expected the other person to successfully decode and compared that number with the number of topics actually decoded. As expected, participants were overconfident: On average, participants expected 97% of their topics to be correctly decoded, compared with the 84% that actually were, t(5) = 3.23, p = .023, d = 1.32. We attribute these results to egocentrism. Because senders knew, for example, that the statement “Blues Brothers, 2000 - now that's a sequel,” was meant to be sarcastic, they egocentrically assumed that their audience would as well. They presumably did not realize how ambiguous the statement really is without verbal emphasis on the word “that's,” a facial gesture such as an eye roll, or some background information about the communicator (such as his or her taste in films). Note, however, that despite reliable overconfidence, accuracy rates were quite high (84%). It would therefore be misleading to suggest from these data that people are poor at communicating sarcasm over e-mail. These data do suggest, however, that however able people are, they are not as able as they believe. One limitation of Study 1 was that although participants were overconfident in their ability to communicate over e-mail, it was unclear whether this overconfidence had anything to do with e-mail per se. After all, numerous studies attest to the general tendency of individuals to be overconfident in their endeavors (e.g., Dunning, Griffin, Milojkovic, & Ross, 1990; Keren, 1987; Lichtenstein, Fischoff, & Phillips, 1982; Oskamp, 1965; Vallone, Griffin, Lin, & Ross, 1990; Wright, Rowe, Boger, & Gammack, 1994). The previous study may thus have simply been yet another instantiation of that general tendency. 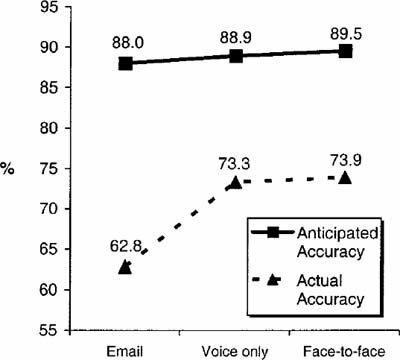 To resolve this ambiguity, in Study 2 we contrasted the overconfidence people display when communicating via e-mail with the overconfidence they display when communicating with their voice. If our egocentrism analysis is correct, then overconfidence should be greater over e-mail than over voice - not because of differences in the perceived ability to communicate but because of differences in the actual ability to communicate. Study 2 also went beyond Study 1 by assessing confidence among both senders and receivers. Although overconfidence in the ability to communicate a message can be problematic, it can be doubly troublesome when accompanied by overconfidence in the ability to interpret that message. We investigated both kinds of overconfidence in Study 2. Sixty Cornell University students participated in exchange for extra credit in an introductory psychology or human development course. Participants completed the experiment in pairs. On arrival to the lab, each member of the pair was escorted to a private room and given a questionnaire. The questionnaire explained that the study concerned how people detect and communicate sarcasm, and that the first part of the experiment involved selecting a series of statements that the other person in the experiment would later be asked to identify as either sarcastic or serious. Participants were next given a list of 20 statements about a number of topics, such as food, Greek life, and Ithaca weather. Half were identified (correctly) as being intended by the original author of the statement to be sarcastic and the other half nonsarcastic. Participants within each pair received a different list so that they would not be sending each other the same statements. Participants then selected 10 of the statements to communicate to the other person in the experiment. They were told to select the statements that they believed would be easiest for the other person to identify as sarcastic or serious. The number of serious versus sarcastic statements varied randomly across participants, with a mean of five statements per category per participant. Up to this point in the experiment, no mention was made of exactly how the statements would be transmitted to the other participant (i.e., via e-mail, voice, or smoke signal) to ensure that participants in the e-mail and voice conditions did not select systematically different statements. Meanwhile, the experimenter randomly assigned one member of the dyad to the e-mail condition and the other member to the voice condition. Participants in the e-mail condition were escorted to a computer and asked to type each statement they had selected into the computer exactly as written. Participants in the voice condition, in contrast, were escorted to a tape recorder and asked to read each statement into the tape recorder exactly as written. Both participants were told that the other participant would later attempt to identify the nature (sarcastic or serious) of each statement. Once they had finished recording their statements, participants predicted how many statements the other participant would be able to decode correctly. Specifically, participants checked a box marked “yes” or “no” for each statement to indicate whether they thought the other person in the experiment would be able to correctly identify the true nature (sarcastic or nonsarcastic) of the statement. Finally, participants listened to (or read) the statements selected by the other participant. Participants then indicated whether they thought each statement was intended to be sarcastic or nonsarcastic as well as whether they thought they had correctly identified the statement (yes or no). All participants were then thanked, debriefed, and dismissed. Study 2 was a 2 (condition: e-mail vs. voice) × 2 (accuracy: anticipated vs. actual) fully within-group factorial, with the dyad as the level of analysis. Because participants communicated different numbers of sarcastic statements, perceived and actual accuracy were converted to a percentage. Responses from one group were over 3 SDs away from the mean on several dependent variables and were excluded from the analysis, yielding a final sample size of 29 dyads. Not surprisingly, participants in the voice condition communicated more effectively than those in the e-mail condition. As shown in Figure 1, participants who listened to the statements decoded nearly three-quarters of them, compared with an accuracy rate indistinguishable from chance (50%) among participants who read them on e-mail. But more important, Figure 1 also shows that e-mailers failed to anticipate this difference. Although participants' actual ability to communicate sarcasm varied considerably depending on whether they used e-mail or their voice, t(28) = 2.53, p = .017, d = 0.47, their confidence in their ability did not (t [less than] 1). This between-condition difference in overconfidence was confirmed by a 2 (e-mail vs. voice) × 2 (predicted vs. actual) fully within-group analysis of variance (ANOVA), which yielded only the predicted interaction, F(1, 28) = 5.20, p = .030, [eta]2 = 0.16. 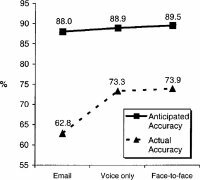 Participants were overconfident when they communicated over e-mail, t(28) = 3.40, p = .002, d = .61, but not when they communicated over voice, t [less than] 1. Figure 1. Anticipated and actual ability to communicate by condition (Study 2). Click on image for larger version. Copyright (c) 2000-2005 Ovid Technologies, Inc.
An interesting finding was that an analogous pattern of overconfidence emerged among participants' ability to detect sarcasm. Recall that after participants attempted to identify the nature (sarcastic or serious) of each statement, they also indicated whether they thought they had been successful. Although participants in the e-mail condition were less able than those in the voice condition to decode sarcasm, they were no less confident (Ms = 89% & 91%, respectively), t [less than] 1. A 2 × 2 ANOVA comparing receivers' perceived and actual ability to detect sarcasm over e-mail and voice revealed that overall, participants were overconfident, F(1, 28) = 33.75, p [less than] .001, [eta]2 = 0.55, but this was particularly true for receivers in the e-mail condition, F(1, 28) = 3.68, p = .065, [eta]2 = 0.12. In sum, participants in this experiment were overconfident in their ability to both convey and detect sarcasm over e-mail, but they were considerably less overconfident over voice. Taken together, the results of Studies 1 and 2 suggest that people are overconfident in their ability to communicate sarcasm over e-mail. Just as people have difficulty divorcing themselves from the melody that inevitably accompanies the act of tapping a song, so, too, do people who send a sarcastic e-mail have difficulty divorcing themselves from the sarcastic tone that inevitably accompanies the act of typing a sarcastic statement. There are, however, several limitations of the data presented thus far. First, whereas Studies 1 and 2 focused exclusively on the communication of sarcasm (or the lack thereof), note that the egocentrism analysis we have offered ought to apply to any subtle form of communication that relies on paralinguistic cues. Thus, in Study 3, we expanded our empirical focus to include not only sarcasm and seriousness, but sadness and anger as well. Second, whereas participants in Studies 1 and 2 were strangers, note that the majority of (nonspam) e-mails in daily life are between acquaintances. This presents a potential threat to external validity. After all, it stands to reason that people are generally better at communicating with people they know than with people they do not, which, all else equal, should be associated with decreased, perhaps even eliminated, overconfidence. To address this possibility, Study 3 compared overconfidence among strangers versus friends. In addition to addressing external validity, note that this comparison also enabled us to examine the more general impact of familiarity on overconfidence in communication. Finally, whereas participants in the voice condition of Study 2 were unable to see one another, this is hardly characteristic of most voice interactions, which are face-to-face (Panko & Kinney, 1995). As such, a more ecologically valid test of the comparative advantages and disadvantages of e-mail versus voice requires a condition in which participants communicate face-to-face. Study 3 included just such a condition. In addition to increasing external validity, note that including three levels of media richness allowed us to examine precisely what it is about e-mail that engenders increased overconfidence. Because we observed greater overconfidence in e-mail than in voice-only communication in Study 2, the lack of intonation alone appears sufficient to increase overconfidence, but gesture and facial expression may also play a role (Daft & Lengel, 1986; Daft & Trevino, 1987). By comparing perceived and actual ability to communicate in e-mail, voice-only, and face-to-face communication, we could find out. One hundred fifty-four pairs of University of Illinois students participated on a volunteer basis. Once each member of the pair agreed to participate, the experimenter explained that the study would involve constructing, and then communicating, a series of five statements, each of which would be paired with one of four emotions or tones. Their job, they were told, would be to successfully communicate each specific emotion or tone to the other participant. The medium with which the statements would be communicated, however, varied by condition: Approximately one third of participants were told that they were to e-mail the statements to one another, and the remaining two thirds were told that they were to speak the statements to one another. Within the latter group, half were further told that they would do so either with or without being able to see one another. That is, instead of communicating face-to-face, they would speak with their backs to one another. Once the pair was told the medium in which they were to communicate, each member was given a list of five topics (music, Illini football, dating, dorm food, and dorm life). Each topic was matched to one of four emotions or tones (sarcasm, seriousness, anger, or sadness). For each topic, the participant's job was to construct a statement that would successfully convey the associated emotion or tone to the other participant when either typed or spoken but without stating the emotion or tone explicitly (e.g., “I am being sarcastic”). Participants also indicated, for each topic, whether they expected the other participant to successfully guess the emotion or tone (on a dichotomous “yes” or “no” scale). Special care was taken to ensure that (a) participants were aware of the communication medium prior to making their predictions (e.g., whether they would be communicating via e-mail, with their voice only, or face-to-face), and that (b) participants understood that the other participant would be picking from a list of the four possible emotions or tones for each topic. As in Study 1, participants in the e-mail condition were restricted from using emoticons. Next, participants communicated the five statements to one another, one at a time, as instructed (i.e., via e-mail, voice-only, or face-to-face). Specifically, one member of the pair (the sender) spoke or typed all five of his or her statements to the other participant (the receiver), and then the pair switched roles. This was done one sentence at a time, which in the e-mail condition meant that the statements were e-mailed one at a time rather than in a single e-mail. After each statement, the receiver attempted to guess the emotion or tone the sender was attempting to convey (from a list of four) and indicated his or her confidence in that guess by checking a box labeled “yes” or “no.” Once this was complete, all participants were then thanked and debriefed. 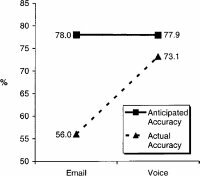 Our primary prediction was that overconfidence would be greater when participants communicated over e-mail than when participants communicated with their voice. To test this prediction, we conducted a 2 (accuracy: anticipated vs. actual) × 2 (order: Round 1 vs. Round 2) × 2 (acquaintanceship: stranger vs. friend) × 3 (medium: e-mail vs. voice-only vs. face-to-face) mixed-model ANOVA with the dyad as the level of analysis. The first two factors in this design were within-participants variables, and the second two were between-participants variables. This analysis revealed several significant effects. First, we observed a significant main effect for communication medium, F(1, 148) = 3.67, p = .028, [eta]2 = .05, indicating that on average, both predicted and actual accuracy for both friends and strangers were higher in the voice conditions than in the e-mail conditions. We also observed a main effect for order, F(1, 148) = 11.67, p = .001, [eta]2 = .07, indicating that on average, predicted and actual accuracy for both friends and strangers were higher during the second round of communication than the first. We also observed an unexpected Accuracy × Order × Acquaintanceship interaction, F(1, 48) = 4.17, p = .043, [eta]2 = .03. On average, overconfidence tended to decrease from Round 1 to Round 2 for strangers but tended to increase for friends. No other main effects or interactions were significant, except for the following two exceptions. First, we observed the predicted main effect for accuracy: Participants predicted that they would successfully communicate more emotions or tones (M = 88.8%) than they actually did (M = 70.4%), F(1, 148) = 118.26, p [less than] .001, [eta]2 = .44. Second, and more important, we observed a significant Accuracy × Medium interaction. 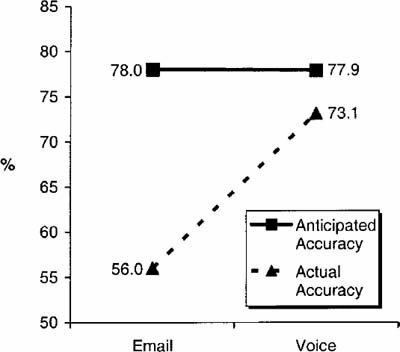 As Figure 2 shows, participants were more overconfident when they communicated over e-mail than when they communicated with their voice, F(2, 148) = 3.31, p = .039, [eta]2 = 0.04. As in Study 2, participants' ability to communicate varied considerably depending on whether they used e-mail or their voice, F(2, 151) = 4.68, p = .011, [eta]2 = 0.06, but their confidence in their ability did not, F [less than] 1, ns. Figure 2. Anticipated and actual ability to communicate by condition (Study 3). Click on image for larger version. An interesting result was that familiarity also had no influence on the results, Fs [less than] 1, ns. This null effect is important for two reasons. First, it suggests increased familiarity does not necessarily translate into increased communication accuracy, contrary to what one might expect. Second, and perhaps more important, it makes it clear that the overconfidence observed in Studies 1 and 2 did not emerge simply because participants were strangers rather than friends. There was also no difference in either predicted or actual communication accuracy between the face-to-face and voice-only conditions, Fs [less than] 1, ns. These data, together with the data presented in Study 2, suggest that the increased overconfidence in e-mail is due to the lack of intonation and vocalization rather than the lack of gesture and expression. That said, this null result is not without alternative interpretations. For instance, whereas participants in Studies 1 and 2 predicted their accuracy after communicating over their assigned medium, participants in Study 3 did so before communicating. Although all participants in Study 3 were well aware of the medium in which they were about to communicate their message, and although the results of Study 3 perfectly dovetail with the results of Studies 1 and 2, it could be argued that collecting predicted accuracy before direct experience with the communication medium diminishes the latter's impact on the former. This methodological feature was necessary in Study 3 to avoid introducing a procedural confound, as only participants in the face-to-face condition would have had access to a listener's nonverbal response to their communication when predicting their communication accuracy. Nevertheless, future research that effectively counterbalances predicted accuracy and actual communication is necessary to draw definitive conclusions about differences in overconfidence between voice and face-to-face interactions. Our final set of analyses focused on overconfidence in participants' ability to comprehend subtleties in communication. Recall that participants in Study 2 were not only overconfident in their ability to convey sarcastic messages, but were also overconfident in their ability to detect sarcastic messages. Study 3 showed a similar pattern. Overall, participants believed that they understood more emotions and tones (M = 89.4%) than they in fact did (M = 70.4%), F(1, 148) = 114.07, p [less than] .001, [eta]2 = 0.44. This effect was bigger, however, in the e-mail condition (M predicted = 89.3% vs. M actual = 62.8%) than in either the face-to-face (M predicted = 89.4% vs. M actual = 73.9%) or voice-only (M predicted = 89.4% vs. M actual = 73.3%) conditions, F(2, 148) = 3.66, p = .028, [eta]2 = 0.05. Here, too, this effect was uninfluenced by acquaintanceship: Participants were just as overconfident when communicating with a stranger as when they were communicating with a friend, F [less than] 1, ns. Why do people overestimate their ability to communicate over e-mail? Our thesis is that people are biased by their own phenomenology when trying to imagine the perspective of someone else. Because people know when they are trying to be sarcastic, for instance, they egocentrically assume that their audience will know as well. Study 4 was the first of two studies designed to test this egocentrism explanation directly. Participants communicated sarcasm to one another in a manner similar to Study 2, with one major exception: Before predicting whether the other participant would interpret the statements correctly, participants were asked to read each statement out loud into a tape recorder. Half of the participants were asked to intonate in a manner consistent with the intended meaning (i.e., to read the sarcastic messages sarcastically) and the other half in a manner inconsistent with the intended meaning (i.e., to read the sarcastic messages seriously). Our reasoning was simple. If people are overconfident in their ability to communicate over e-mail partly because of the difficulty of moving beyond their own perspective, then forcing people to adopt a perspective different from their own ought to reduce this overconfidence. As a result, participants who vocalized the messages in a manner inconsistent with the intended meaning should be less overconfident than those who vocalized the messages in a manner consistent with the intended meaning. Fifty-four University of Illinois students participated in pairs in exchange for course credit in an introductory psychology course. As in Study 2, participants were given one of two lists of 20 statements, half of which were sarcastic and half of which were not. Participants were told to select 10 statements that they felt would be particularly easy for the other participant to identify as either sarcastic or serious and to type each one into a computer for the other participant to read later in the experiment. Up to this point, the procedure mirrored Study 2 except that there was no voice condition (i.e., all participants communicated with one another via e-mail), and participants were asked to select five sarcastic and five serious statements (instead of a varying number as in Study 2). When they finished typing, participants were asked to record each statement into a tape recorder, ostensibly for “later analysis.” Half of the participants were asked to vocalize each statement just as intended, that is, to speak in a sarcastic tone when reading the sarcastic statements and in a serious tone when reading the nonsarcastic sentences. The other half of participants were asked to record each statement in the opposite manner, that is, to say the sarcastic statements seriously and the serious statements sarcastically. After recording each sentence, participants in both conditions rated how sarcastic or nonsarcastic the sentence sounded to them on a scale from 1 (very nonsarcastic) to 11 (very sarcastic) and then predicted whether the other participant in the experiment would be able to correctly identify the statement. Finally, participants read the statements that had been e-mailed by the other participant in the experiment. As in Study 2, participants indicated whether they thought the statement was intended to be sarcastic or nonsarcastic as well as whether they thought they had guessed correctly or not. All participants were then thanked, debriefed, and dismissed. Our primary prediction was that asking participants to read their messages aloud in a manner inconsistent with their intended meaning would change their phenomenological experience of the stimuli - that is, the sarcastic statements would no longer “sound” quite so sarcastic, nor the serious statements quite so serious - and as a consequence, would reduce overconfidence. 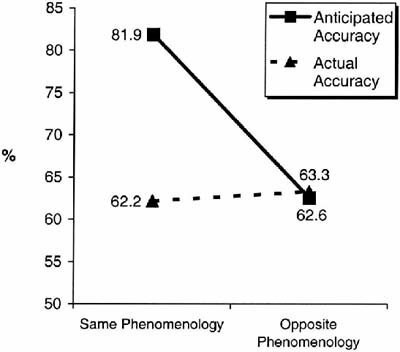 Consistent with the first part of this prediction, participants in the opposite-phenomenology condition indicated that the sarcastic statements sounded less sarcastic (M = 4.31) than those in the same-phenomenology condition (M = 7.79), t(26) = 7.78, p [less than] .001, d = 1.50. 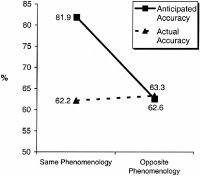 Similarly, the serious statements sounded less serious to participants in the opposite-phenomenology condition (M = 7.04) than they did to participants in the same-phenomenology condition (M = 3.27), t(26) = 8.77, p [less than] .001, d = 1.69. Because participants were assigned to conditions after selecting their statements, these differences suggest that the manipulation was successful in changing senders' own subjective interpretation of the stimuli. To investigate whether these differences influenced overconfidence, predicted and actual communication were compared in a 2 (phenomenology: same vs. opposite) × 2 (accuracy: anticipated vs. actual) fully within-group ANOVA, with accuracy operationalized as the percentage of statements correctly identified as either sarcastic or nonsarcastic. This analysis revealed two interesting effects. First, there was a main effect of accuracy: As in the previous three studies, anticipated accuracy (M = 72.3%) exceeded actual accuracy (M = 62.8%), F(1, 26) = 6.13, p = .020, [eta]2 = 0.19. Second, and more important, this main effect was qualified by a significant interaction, F(1, 26) = 8.44, p = .007, [eta]2 = 0.25. As shown in Figure 3, the phenomenology manipulation completely erased participants' overconfidence. Whereas participants in the same-phenomenology condition overestimated the number of sentences their partner in the experiment would be able to correctly identify, t(26) = 4.89, p [less than] .001, d = 0.94, there was no difference in anticipated and actual communication among participants in the opposite-phenomenology condition, t [less than] 1. Figure 3. Anticipated and actual ability to communicate by condition (Study 4). Click on image for larger version. As in the previous two studies, participants also were overconfident in their ability to detect sarcasm. On average, participants believed they correctly identified 88.2% of the statements, compared with the actual accuracy rate of 62.8%, F(1, 26) = 59.09, p [less than] .001, [eta]2 = 0.70. This difference was uninfluenced by condition, F [less than] 1, which is hardly surprising given that we manipulated the sender's phenomenology, not the receiver's. Studies 1 through 3 demonstrated that people are overconfident in their ability to communicate sarcasm, seriousness, anger, and sadness over e-mail, and Study 4 implicated egocentrism as a probable source of this overconfidence. Study 5 was intended to supplement these results by exploring what may be an even more common variety of miscommunication over e-mail: humor. Informal observation suggests that attempts at humor are often less successful over e-mail than one would think. A “funny” joke, “amusing” anecdote, or “hilarious” tale often does not pack the intended punch over e-mail, likely for many of the same reasons attempts to convey emotions and tones over e-mail can fail us. Without the verbal channel, nuances of expression, timing, and emphasis are lost, and our electronic attempts at humor can fall flat. Half of the participants simply read the jokes and then e-mailed them, whereas the other half first watched a videotape of the jokes being read on the TV show Saturday Night Live (SNL). As SNL fans know, part of what makes these jokes funny (and all jokes, for that matter) is not merely the observations themselves, but the nuances of timing and delivery. Thus, we expected participants in the videotape condition to find the observations funnier than would participants in the control condition. But more than that, we expected this difference to translate into participants' predictions of how the jokes would be perceived by the other person in the experiment. Although the actual content of the e-mail would be constant across conditions, we expected that participants would have a hard time distinguishing their subjective experience of the joke from its objective properties available to the person at the other end of the computer. As a result, participants in the videotape condition should expect their e-mail recipient to find the “deep thoughts” funnier than should participants in the control condition. Thus, whereas Study 4 sought to decrease the rift between perception and reality, the present study sought to increase it. Fifty-eight University of Illinois students participated in exchange for course credit in an introductory psychology course. Next, participants selected the five “deep thoughts” that they thought were the funniest, which they were told (correctly) would be e-mailed to another participant later in the experiment. 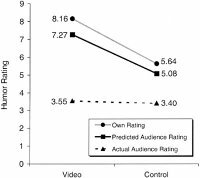 Participants in the videotape condition (n = 19) next watched a video compilation of all the “deep thoughts” as being performed on SNL, whereas participants in the control condition (n = 20) did not. All participants then rated how funny they thought each “deep thought” was as well as how funny they thought the person on the other end of the e-mail would think it was. Each rating was made on a separate 1 (not at all funny) to 11 (very funny) scale. The order in which participants provided their own humor rating and their anticipated humor rating was counterbalanced. In the second phase of the experiment, each participant's selections were e-mailed to a yoked participant (n = 29) who was told to simply read and rate the humor of the five “deep thoughts” using the same scale as above. The order in which Phase 1 participants made their ratings did not influence the results and is not discussed further. Our primary predictions were that participants in the SNL condition would find the “deep thoughts” more humorous than those in the control condition, and that this difference would translate into participants' predictions about how the jokes would be evaluated by the person at the other end of the computer. As shown in Figure 4, our predictions were confirmed. Participants in the videotape condition thought that the “deep thoughts” were funnier than did participants in the control condition, t(27) = 7.82, p = .009, d = 0.98, and the same was true of participants' predictions of the recipients' evaluation of the jokes, t(27) = 7.97, p = .009, d = 0.99. Also as shown in Figure 4, this was true despite equivalent actual audience humor ratings in the two conditions, t [less than] 1. As a result, participants overestimated how funny their e-mail recipient would find the jokes, F(1, 27) = 19.55, p [less than] .001, [eta]2 = 0.42. 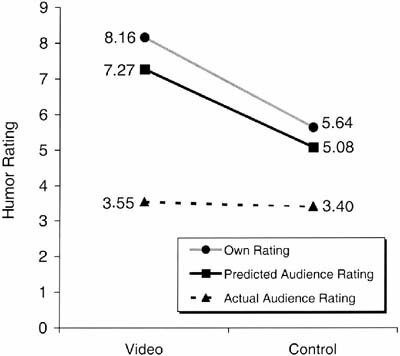 However, a 2 (condition: videotape vs. control) × 2 (audience humor rating: anticipated vs. actual) ANOVA revealed a significant interaction, F(1, 27) = 3.58, p = .069, [eta]2 = 0.12, indicating that this was especially true among participants in the videotape condition. Figure 4. Own, predicted audience, and actual audience humor ratings by condition (Study 5). Humor ratings were on a scale ranging from 1 (not at all funny) to 11 (very funny). Click on image for larger version. These findings further implicate the role of egocentrism in e-mail (mis)communication. As in Study 4, participants' assessments of the stimuli available to their e-mail recipient were influenced by their own phenomenological experience of the stimuli. As a result, participants overestimated the extent to which humor would be conveyed, but this was particularly true when participants' own phenomenological experience of the stimuli was especially rich. These results are analogous with those of Vorauer and Ross (1999), who found that people overestimated the extent to which their personality traits were transparent to an interaction partner, especially when self-knowledge was salient to them. Note, however, that participants were hardly unaware that their audience's perspective would differ from their own. As Figure 4 shows, participants recognized that others might not find the jokes quite as funny as they did (the difference between the dashed and solid-black lines). However, as Figure 4 also shows, this difference was not only underestimated, but was completely insensitive to the actual difference in humor. As can be seen, the difference between e-mailers' own impression of the stimuli and their predictions of the e-mail recipients' impression of stimuli was the same regardless of the extremity of the participants' own perspective. As a result, the greater the difference between e-mailers' own perspective of the stimuli and that of their audience, the greater the miscalibration in e-mailers' predictions. If comprehending human communication consisted merely of translating sentences and syntax into thoughts and ideas, there would be no room for misunderstanding. But it does not, and so there is. People convey meaning not only with what they say, but also with how they say it. Gesture, voice, expression, context - all are important paralinguistic cues that can disambiguate ambiguous messages (Archer & Akert, 1977; Argyle, 1970; DePaulo & Friedman, 1998). Indeed, it is not uncommon for paralinguistic information to more than merely supplement linguistic information, but to alter it completely. The sarcastic observation that “Blues Brothers, 2000 - now that's a sequel” may imply one thing in the presence of paralinguistic cues but quite the opposite in the absence of them. The research presented here tested the implications of these observations for the rapidly escalating technology of e-mail, a communication medium largely lacking in paralinguistic information. We predicted that because of this limitation subtle forms of communication such as sarcasm and humor, would be difficult to convey. But more than that, we predicted that e-mail communicators would be largely unaware of this limitation. Because participants knew what they intended to communicate, we expected them to assume that their audience would as well. Five studies confirmed these predictions. In each one, participants overestimated their ability to communicate over e-mail. This was true regardless of whether participants were trying to communicate sarcasm (Studies 1 through 3), humor (Study 5), or some other emotion or tone (Study 4), and regardless of whether participants were free to craft their own communication (Studies 1 and 3) or were constrained by the experimenter (Studies 2, 4, and 5). Studies 2 through 5 also shed light on one cause of this miscalibration. We reasoned that when people try to anticipate the perspective of their e-mail audience, they focus excessively on their own phenomenology or experience and insufficiently consider the audience's perspective. This implies that the greater the difference between the communicator's own interpretation of the stimuli and the stimuli available to the audience, the greater the miscalibration. Consistent with this account, we found in Studies 2 and 3 that overconfidence was greater when participants communicated over e-mail than by voice, presumably because they failed to consider the extent to which their audience's perspective was different from their own. As shown in Figures 1 and 2, whereas the ability to communicate varied considerably depending on whether participants communicated by e-mail or voice, confidence in that ability did not. To their credit, participants did not assume that their audience would identify all of their sarcastic statements and thus seemed to realize that their audience did not share their own “privileged” perspective. But nor did they take adequate account of the gulf between their own perspective and their audience's. More direct evidence came from Studies 4 and 5, in which manipulations of e-mailers' own phenomenologies produced corresponding changes in their estimates of what they had communicated to their audience, with overconfidence reduced when the e-mailers' phenomenology was brought into line with their audience's (Study 4) and increased when it was made even more discrepant (Study 5). In other words, whereas Studies 2 and 3 held constant the phenomenology of the communicator and manipulated the richness of the stimuli available to the audience, Studies 4 and 5 held constant the stimuli available to the audience and manipulated the phenomenology of the communicator. In each case, however, overconfidence varied as a function of the difference between the e-mailer's impression of the stimuli and the stimuli available to the e-mail recipient: The bigger the rift between the two, the greater the overconfidence. Along the way, we also found that participants overestimated their ability to interpret e-mail. In Studies 2 through 4, participants overestimated their ability to discern emotions and tones, and Studies 2 and 3 revealed that this was particularly true over e-mail. Although not central to our hypotheses, we cannot help but note that egocentrism likely plays a role here as well. Once a statement is interpreted as, say, sarcastic, it may be difficult to “hear” the statement any other way, leading people to believe they understood their partner's communication better than they actually did (cf. Ross & Ward, 1996). There are, however, some alternative interpretations of these results that deserve mention. For example, it is possible (albeit unlikely) that participants were simply unfamiliar with e-mail and thus were unaware of its limitations. If so, then the observed overconfidence may have been a function not of egocentrism, but of the novelty of e-mail. Although the background of our participants limits this possibility (most used e-mail regularly, if not obsessively, and all had a personal e-mail account), we suspect that experience with e-mail is an important moderator worth investigating in future research. A reasonable hypothesis is that the more experience people have communicating over e-mail, the less overconfident they are likely to be. Whether overconfidence disappears, however, remains to be seen. Another possibility is that these results were produced by a misunderstanding of statistical regression. Whenever two variables are imperfectly correlated, extreme values on one variable are associated with less-extreme values on the other. Because communicators' own impressions of the stimuli were likely imperfectly correlated with their audience's, and because participants selected statements that were (to them) particularly funny or sarcastic, they may have failed to recognize that their audience's impressions were likely to be less extreme than their own by chance alone (cf. Kahneman & Tversky, 1973). Note, however, that this possibility cannot account for the interactions observed in Studies 2 through 5 and thus cannot account for our overall pattern of results. It is also possible that there were important differences between the way participants communicated with one another in our studies and the way people communicate with one another in everyday life that may have influenced the results. For instance, the voice conditions in our studies may have differed from everyday voice communication on factors such as time to plan remarks and level of distraction, which may have influenced calibration. As well, note that we explicitly prohibited participants in the e-mail conditions from using emoticons, which is hardly a feature of most e-mail programs. Although this design feature was necessary to maximize internal validity, it does raise questions about external validity. After all, emoticons are specifically designed to reduce the ambiguity of e-mail communication; thus, prohibiting participants from using them may have artificially reduced accuracy and increased overconfidence. Despite the surface plausibility of this caveat, there are several reasons to doubt it. First, note that although emoticons can help disambiguate messages, many emoticons are themselves ambiguous (does that “;-)” after “I'm really looking forward to seeing you” mean that she is flirting - or kidding?). Second, note that people typically use disambiguating emoticons only when they feel that there is an ambiguity that needs disambiguating, an event that the present research suggests people are likely to underestimate. Further reason to doubt this alternative comes from a follow-up study. Participants e-mailed a series of statements to one another in a manner similar to that of Study 3. In particular, participants were given a list of 10 topics (e.g., music, politics, dorm life) and for each one were asked to construct a sentence that would effectively communicate a specified emotion or tone (such as sarcasm or anger). They were told (correctly) that each statement would be e-mailed to another participant in the experiment, the latter of whom would then try to guess the intended emotion or tone (from a provided list of 20). We predicted, as in the previous studies, that senders would overestimate the success rate of receivers. Unlike the previous studies, however, we experimentally manipulated whether participants were able to use emoticons. We found that overconfidence did not differ between those who were using emoticons and those who were not. Thus, it does not appear that our results can be attributed to the restriction against the use of emoticons. Nor can the results be attributed to the lack of acquaintanceship of our participants. We explicitly examined this issue in Study 3 and found that overconfidence was independent of whether participants were acquainted with their communication partner. At first blush, this would seem counterintuitive. After all, it stands to reason that people are generally better at communicating with people they know than with people they do not, which, all else equal, should be associated with decreased, perhaps even eliminated, overestimation of that accuracy. But all, we suspect, is not equal. First, note that even if familiarity was associated with improved communication, it would also be likely to be associated with improved confidence, which might result in increased, rather than decreased, overconfidence (cf. Gill, Swann, & Silvera, 1998; Swann & Gill, 1997; Van Boven et al., 2000). Second, it is not clear that acquaintanceship ought to enhance accuracy to begin with: Prosody is shared, and it is unclear whether familiarity with one's speaker or addressee would convey much additional benefit. Indeed, in Study 3, we found no evidence of increased communication effectiveness among acquaintances. Although our focus has been on e-mail miscalibration, we believe that the overconfidence we have documented here likely characterizes a wide range of rapidly emerging media types. Chat rooms, instant messaging, text-based gaming environments - all have been touted for their superiority to asynchronous text media such as e-mail because of the dynamic nature of the discourse and ability to provide rapid feedback. But because these synchronous media are largely text-based, there likely remains a rift between the subjective stimuli available to the communicator and the objective stimuli available to the audience that communicators may fail to fully appreciate. In fact, we suspect the synchronous and rapid nature of these mediums may actually increase the rift between senders and receivers. Compared with synchronous media, asynchronous text media such as e-mail more readily allow for reflection and reconsideration of one's communication before transmission. As we saw in Study 4, such a moment of reconsideration may allow communicators to recognize the ambiguity inherent in their messages and thereby increase communication calibration. Of course, future research is necessary in order to test these hypotheses. To be sure, we do not mean to suggest that egocentrism in communication is always undesirable. As others have pointed out, using one's own perspective as an indicator of another's is a generally valid, useful heuristic - one whose absence would render effective communication overwhelmingly difficult (Davidson, 1982; Hoch, 1987; Nickerson, 2001). But in a world with as many diverging perspectives as our own, the downside to egocentrism seems quite clear as well. To the extent that successful communication depends on an accurate assessment of one's clarity (Keysar & Henley, 2002), overconfidence of that clarity reduces the quality of communication. Specifically, overestimating the obviousness of one's intentions can lead to insufficient allowances for ambiguities in communication - with occasionally destructive results (Kruger, Gordon, & Kuban, in press). Consider, for example, the phenomenon known in electronic bulletin boards and e-mail groups as “flaming”; the cascade of openly hostile e-mail that follows a violation of electronic etiquette, or “netiquette” (Sproull, Kiesler, & Zubrow, 1984). Although this phenomenon was originally attributed to the disinhibition and deindividuation afforded by the anonymity of the Internet (Kiesler et al., 1984; Siegel, Dubrovsky, Kiesler, & McGuire, 1986; Sproull & Kiesler, 1991), evidence for this interpretation is at best mixed (Lea, O'Shea, Fung, & Spears, 1992; Lea & Spears, 1991). Instead, we suspect that the phenomenon can be traced, at least in part, to egocentrism. To the extent that people overestimate the obviousness of the fact that they are “just kidding” when they poke fun or criticize, they may unwittingly offend. Abrahams, R. D. (1962). Playing the dozens. Journal of American Folklore, 75, 209–220. Agnes, M., (Ed.) (1999). Webster's new world dictionary (4th ed.). New York: Macmillan. Allbritton, D. W., McKoon, G., & Ratcliff, R. (1996). Reliability of prosodic cues for resolving syntactic ambiguity. Journal of Experimental Psychology, 22, 714–735. Archer, D., & Akert, R. M. (1977). Words and everything else: Verbal and nonverbal cues in social interpretation. Journal of Personality and Social Psychology, 35, 443–449. Argyle, M. (1970). Social interaction. New York: Atherton Press. Camerer, C., Loewenstein, G., & Weber, M. (1989). The curse of knowledge in economic settings: An experimental analysis. Journal of Political Economy, 97, 1232–1254. Daft, R. L., & Lengel, R. H. (1986). Organizational information requirements, media richness, and structural design. Management Science, 32, 554–571. Daft, R. L., & Trevino, L. (1987). Message equivocality, media selection, and manager performance. MIS Quarterly, 11, 355–366. Davidson, D. (1982). Paradoxes of irrationality. In R. Wollheim & J. Hopkins (Eds. ), Philosophical essays on Freud (pp. 289–305). Cambridge, England: Cambridge University Press. de la Sola Pool, I. (1984). Communication flows: A census in the United States and Japan. Amsterdam: University of Tokyo Press. Dennis, A. R., & Kinney, S. T. (1998). Testing media richness theory in the new media: The effects of cues, feedback, and task equivocality. Information Systems Research, 9, 256–274. DePaulo, B. M., & Friedman, H. S. (1998). Nonverbal communication. In D. T. Gilbert, S. T. Fiske, & G. Lindsey (Eds. ), The handbook of social psychology: Vol. 2 (4th ed., pp. 3–40). New York: McGraw-Hill. Dimmick, J., Kline, S., & Stafford, L. (2000). The gratification niches of personal e-mail and the telephone: Competition, displacement, and complementarily. Communication Research, 27, 227–248. Drew, P. (1987). Po-faced receipts of teases. Linguistics, 25, 219–253. Dunning, D., Griffin, D. W., Milojkovic, J. D., & Ross, L. (1990). The overconfidence effect in social prediction. Journal of Personality and Social Psychology, 58, 568–581. Epley, N., Keysar, B., Van Boven, L., & Gilovich, T. (2004). Perspective taking as egocentric anchoring and adjustment. Journal of Personality and Social Psychology, 87, 327–339. Fischhoff, B. (1975). Hindsight = = foresight: The effects of outcome knowledge on judgment under uncertainty. Journal of Experimental Psychology: Human Perception and Performance, 1, 288–299. Flavell, J. (1977). Cognitive development. Englewood Cliffs, NJ: Prentice Hall. Fussell, S. R., & Krauss, R. M. (1991). Accuracy and bias in estimates of others' knowledge. European Journal of Social Psychology, 21, 445–454. Gatz, L. B., & Hirt, J. B. (2000). Academic and social integration in cyberspace: Students and e-mail. Review of Higher Education, 23, 299–318. Gill, M. J., Swann, W. B., & Silvera, D. H. (1998). On the genesis of confidence. Journal of Personality and Social Psychology, 75, 1101–1114. Gilovich, T., Medvec, V. H., & Savitsky, K. (2000). The spotlight effect in social judgment: An egocentric bias in estimates of the salience of one's own actions and appearance. Journal of Personality and Social Psychology, 78, 211–222. Gilovich, T., Savitsky, K., & Medvec, V. H. (1998). The illusion of transparency: Biased assessments of others' ability to read one's emotional states. Journal of Personality and Social Psychology, 75, 332–346. Handey, J. (1992). Deep thoughts. New York: Penguin. Hebert, B. G., & Vorauer, J. D. (2003). Seeing through the screen: Is evaluative feedback communicated more effectively in face-to-face or computer-mediated exchanges? Computers in Human Behavior, 19, 25–38. Hoch, S. (1987). Perceived consensus and predictive accuracy: The pros and cons of projection. Journal of Personality and Social Psychology, 53, 221–234. Inhelder, B., & Piaget, J. (1958). The growth of logical thinking from childhood to adolescence: An essay on the construction of formal operational structures. New York: Basic Books. Kelley, C. M., & Jacoby, L. L. (1996). Adult egocentrism: Subjective experience versus analytic bases for judgment. Journal of Memory and Language, 35, 157–175. Keren, G. (1987). Facing uncertainty in the game of bridge: A calibration study. Organizational Behavior and Human Decision Processes, 39, 98–114. Keysar, B. (1994). The illusory transparency of intention: Linguistic perspective taking in text. Cognitive Psychology, 26, 165–208. Keysar, B., Barr, D. J., & Horton, W. S. (1998). The egocentric basis of language use: Insights from a processing approach. Current Directions in Psychological Science, 7, 46–50. Keysar, B., & Bly, B. (1995). Intuitions of the transparency of idioms: Can one keep a secret by spilling the beans? Journal of Memory and Language, 34, 89–109. Keysar, B., & Henly, A. S. (2002). Speakers' overestimation of their effectiveness. Psychological Science, 13, 207–212. Kiesler, S., Siegel, J., & McGuire, T. W. (1984). Social psychological aspects of computer-mediated communication. American Psychologist, 39, 1123–1134. Krauss, R. M.et al. (1981). Verbal, vocal, and visible factors in judgments of another's affect. Journal of Personality and Social Psychology, 40, 312–320. Kruger, J., Gordon, C., & Kuban, J. (in press) Intentions in teasing: When “just kidding” just isn't good enough. Journal of Personality and Social Psychology. Lanzetta, J. T., & Kleck, R. E. (1970). Encoding and decoding of nonverbal affect in humans. Journal of Personality and Social Psychology, 16, 12–19. Lea, M., O'Shea, T., Fung, P., & Spears, R. (1992). “Flaming” in computer-mediated communication: Observations, explanations, implications. In M. Lea (Ed. ), Contexts of computer-mediated communication (pp. 89–112). New York: Harvester Wheatsheaf. Lea, M., & Spears, R. (1991). Computer-mediated communication, de-individuation and group decision-making. International Journal of Man-Machine Studies, 34, 283–301. Lichtenstein, S., Fischhoff, B., & Phillips, L. D. (1982). Calibration of probabilities: The state of the art to 1980. In D. Kahneman, P. Slovic, & A. Tversky (Eds. ), Judgment under uncertainty: Heuristics and biases (pp. 306–334). Cambridge, England: Cambridge University Press. Marold, K. A., & Larson, G. (1999). Is the range war over? An investigation into preferences for e-mail and v-mail. Social Science Computer Review, 17, 466–471. Newton, L. (1990). Overconfidence in the communication of intent: Heard and unheard melodies. Unpublished doctoral dissertation, Stanford University, Stanford, CA. Nickerson, R. (1999). How we know—and sometimes misjudge—what others know: Imputing one's own knowledge to others. Psychological Bulletin, 125, 737–759. Nickerson, R. S. (2001). The projective way of knowing: A useful heuristic that sometimes misleads. Current Directions in Psychological Science, 10, 168–172. Oskamp, S. (1965). Overconfidence in case-study judgments. Journal of Consulting Psychology, 29, 261–265. Panko, R., & Kinney, S. T. (1995). Meeting profiles: Size, duration, and location. Proceedings of the Twenty-Eighth Annual Hawaii International Conference on System Sciences, 4, 1002–1011. Price, P. J., Ostendorf, M., Shattuck-Hufnagel, S., & Fung, C. (1991). The use of prosody in syntactic disambiguation. Journal of the Acoustical Society of America, 90, 2956–2970. Rime, B. (1982). The elimination of visible behaviour from social interactions: Effects on verbal, nonverbal and interpersonal variables. European Journal of Social Psychology, 12, 113–129. Ross, L., & Ward, A. (1996). Naive realism in everyday life: Implications for social conflict and misunderstanding. In E. Reed, E. Turiel, & T. Brown (Eds. ), Social cognition: The Ontario Symposium (pp. 305–321). Hillsdale, NJ: Erlbaum. Sherman, R. C., End, C., Kraan, E., Cole, A., Campbell, J., Klausner, J., & Birchmeier, Z. (2001). Metaperception in cyberspace. Cyberpsychology and Behavior, 4, 123–129. Siegel, J., Dubrovsky, V., Kiesler, S., & McGuire, T. W. (1986). Group processes in computer-mediated communication. Organizational Behavior and Human Decision Processes, 37, 157–187. Sproull, L., & Kiesler, S. (1986). Reducing social context cues: Electronic mail in organizational communication. Management Science, 32, 1492–1512. Sproull, L., & Kiesler, S. (1991). Connections: New ways of working in the networked organization. Cambridge, MA: MIT Press. Sproull, L., Kiesler, S., & Zubrow, D. (1984). Encountering an alien culture. Journal of Social Issues, 40, 31–48. Swann, W. B., Jr., & Gill, M. J. (1997). Confidence and accuracy in person perception: Do we know what we think we know about our relationship partners? Journal of Personality and Social Psychology, 73, 747–757. Thompson, L., & Nadler, J. (2002). Negotiating via information technology: Theory and application. Journal of Social Issues, 58, 109–124. Thompson, L. L. (2001). The mind and heart of the negotiator (2nd ed.). Upper Saddle River, NJ: Prentice Hall. Vallone, R. P., Griffin, D. W., Lin, S., & Ross, L. (1990). Overconfident predictions of future actions and outcomes by self and others. Journal of Personality and Social Psychology, 58, 582–592. Van Boven, L., Kruger, J., Savitsky, K., & Gilovich, T. (2000). When social worlds collide: Overconfidence in the multiple audience problem. Personality and Social Psychology Bulletin, 26, 619–628. Vorauer, J. D., & Claude, S. D. (1998). Perceived versus actual transparency of goals in negotiation. Personality and Social Psychology Bulletin, 24, 371–385. Vorauer, J. D., & Ross, M. (1999). Self-awareness and feeling transparent: Failing to suppress one's self. Journal of Experimental Social Psychology, 35, 415–440. Walther, J. B. (1993). Impression development in computer-mediated interaction. Western Journal of Communication, 57, 381–398. Walther, J. B. (1995). Relational aspects of computer-mediated communication: Experimental observations over time. Organization Science, 6, 186–203. Walther, J. B., Loh, T., & Granka, L. (2005). Let me count the ways: The interchange of verbal and nonverbal cues in computer-mediated and face-to-face affinity. Journal of Language and Social Psychology, 24, 36–65. Wittaker, S., & Sidner, C. (1997). E-mail overload: Exploring personal information management of e-mail. In S. Kiesler (Ed. ), Culture of the Internet (pp. 277–295). Mahwah, NJ: Erlbaum. Wright, G., Rowe, G., Boger, F., & Gammack, J. (1994). Coherence, calibration, and expertise in judgmental probability forecasting. Organizational Behavior and Human Decision Processes, 57, 1–25. 1. An analogous example comes from a study by Keysar and Henly (2002) in which participants read aloud several ambiguous sentences (such as “Angela killed the man with the gun”) to another study participant. Speakers read the statement after reading a scenario that resolved the ambiguity of the sentence (e.g., indicated whether the gun was the murder weapon or a possession of the victim), a scenario that was unavailable to listeners. As in the case of the tapping study, speakers assumed that what was obvious to them (i.e., the meaning of the sentence) would be obvious to the listener. Consistent with the speculation of Newton (1990) and Ross and Ward (1996), Keysar and Henly found that the overestimation was due, at least in part, to participants underestimating the ambiguity of their own utterances. 2. According to the Web site, these emoticons imply that the e-mailer “speaks with a forked tongue,” is “confused,” and is “unsure,” respectively. 3. The common usage of the term sarcasm in the United States differs from most dictionary definitions. Webster's, for instance, offers the example of “My, you're early” being said to a latecomer as an example not of sarcasm, but of irony (Agnes, 1999, p. 1272), whereas most Americans would say that the opposite is true. In the present article, we follow the convention set in past research (Keysar, 1994; Keysar et al., 1998) and colloquial use by referring to instances in which one's intended meaning differs from the literal meaning as sarcasm. 4. Decision theorists may point out that an answer of “no” to this question is irrational because it implies that the person believes that his or her answer to the question is less than 50% likely to be correct, and if so, the participant should change it (there being only one other possible response). Given the frequency of “no” responses, we suspect that participants interpreted the question differently than decision theorists. 5. We included this prerequisite regardless of condition in order to minimize sampling bias. 6. We included nonsarcastic as well as sarcastic statements in our measures of perceived and actual accuracy because we expected our manipulation to change not only the phenomenological experience of the sarcastic statements, but the phenomenological experience of the nonsarcastic statements as well. 7. Notice that the videotape manipulation in this experiment is also relatively immune to an alternative interpretation of Study 4 based on experimenter demand. It is possible, after all, that deliberately asking participants to read their statements in a manner different from that originally intended may have led them to infer that the purpose of the manipulation was to reduce overconfidence and to change their responses in an effort to be consistent with this hypothesis. Although this and other demand-related interpretations are perhaps unlikely given that we found evidence for our proposed mediating variable (i.e., the phenomenological experience of the stimuli covaried by condition), Study 5 diminishes this concern even further because the videotape manipulation is a much more subtle manipulation of participants' phenomenology and presumably contains no experimental demand. Correspondence concerning this article should be addressed to Justin Kruger, New York University, Leonard N. Stern School of Business, [...]. This research was supported by Research Grant 1-2–69853 from the University of Illinois Board of Trustees awarded to Justin Kruger and by National Science Foundation Grant SES-0241544 awarded to Nicholas Epley. We thank Tom Gilovich and Ken Savitsky for their helpful suggestions throughout this research.